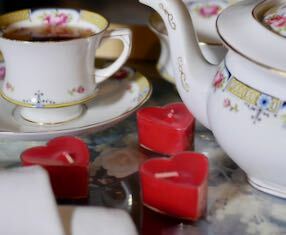 Valentine’s is a fabulous time to host a tea party. The timing is perfect – some people find February quiet, feel that spring is too far off and may even be still feeling the January ‘blues’! Thus, your friends may welcome a chance to come together and share a tea as well. 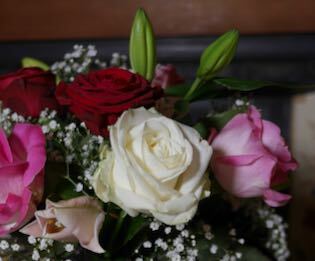 And Valentine’s is such a pretty theme – roses, chocolate, candles, romance – there’s so much to work with! So let’s get started on creating a fabulous special teatime with your friends. Start with a handwritten formal invitation. In this ‘digital age’ people find it so special to receive a paper invitation. 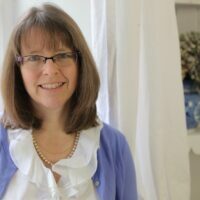 Of course you could also send an artistic and creative invitation through online messaging. Either way, make it personal with a special message. This is the time to get out your finest china – don’t leave it in the cupboard. And if you need to mix and match that’s great – people often like to choose their own pretty teacup. 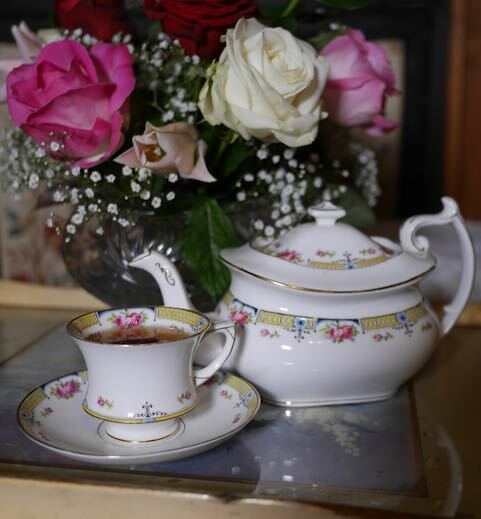 I’ve noticed that as mugs are used on a daily basis, the chance to use an elegant tea set is most enjoyed. Now let’s talk about the menu. 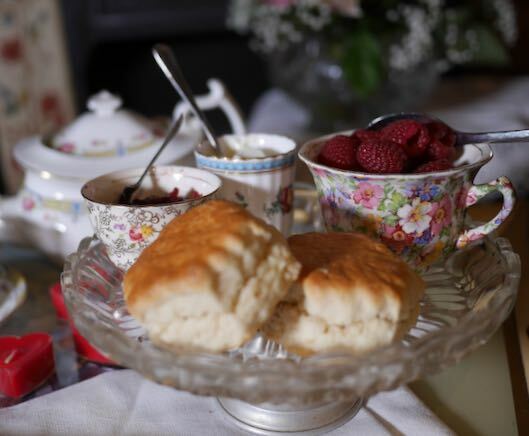 Traditionally, afternoon tea includes sandwiches, scones with clotted cream and jam, and delicious, small cakes. But of course, you can serve what suits your tea time. Savoury canapes can be served instead of sandwiches, scones can be small to allow for the many other food items, fresh fruit is always a welcome addition and chocolate is a must! Use some small pretty cups to serve the jam and cream. Recently I had afternoon tea with several savoury canapes and they were such a delicious addition. If you do serve sandwiches, take the time to cut off the crusts and cut the sandwiches into small shapes; triangles, rectangles or even hearts! 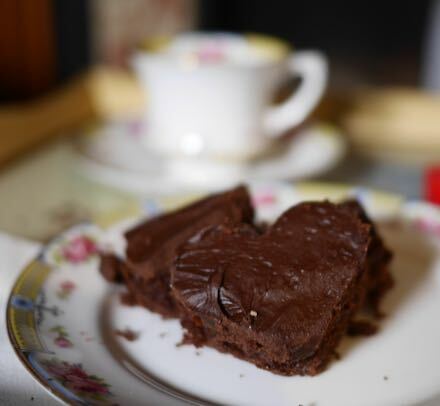 Now for you chocoholics out there: I often serve my simple brownies cut into heart shapes. Just make your favourite brownies and cut them with a heart shaped cookie cutter and voila – you have a great look. Finally, let’s address the décor of your ‘tea-room’ – whether this is your kitchen, dining room or a living room. I think that all you really need are candles and roses. My local grocery store puts their flowers on sale at a discount at the end of every day and I have been lucky enough to get a dozen roses at a very low cost! And since it’s winter, a warm fire burning would make the whole experience cozy. Candles are such a graceful addition to the tea. The best part about a tea party is the relaxed time to visit with friends. 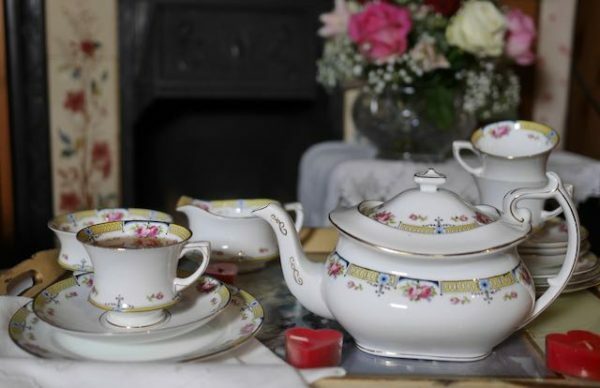 Luckily, all the parts of the tea can be prepared in advance and once your friends have arrived, all you as the hostess need to do is keep a fresh pot of tea going. 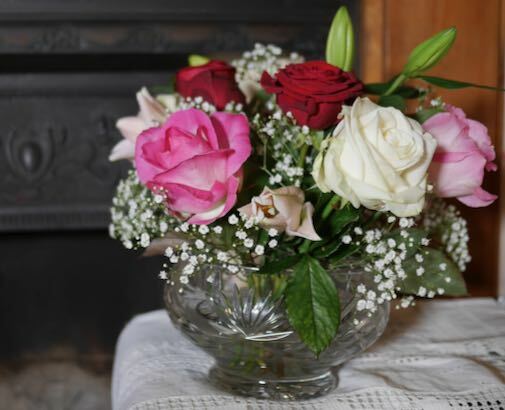 So be sure to sit down, relax and enjoy your guests on Valentine’s!